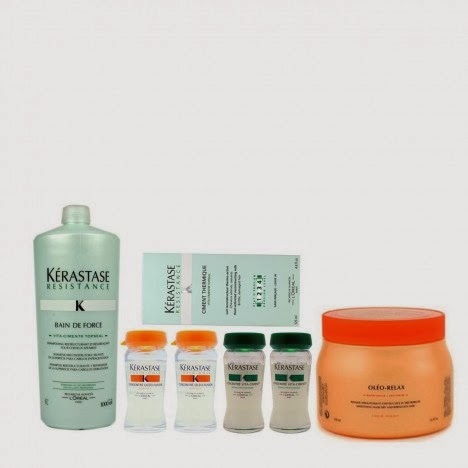 SALON VIM: KERASTASE KERATHERMIE TREATMENT - . Introducing you Karastase signature treatment -Kerathermie treatment. I highly recommend this for people who have weak and dry hair. It actually uses 2 bottle of ampoules treatment, which includes vita cement n oleo fusion by section until every strand is treated in 45 mins! Vita cement is to help strengthen back the hair, formulae to harden the hair n makes it stronger n prevents it from breaking easily, suitable for hair that has gone through lots of chemcial works, as for oleo fusion, is for dry hair, it bring back moisture for the hair. The process of flat ironing the hair is to allow deeper penetration in the hair, followed by the mask. Quote my name "REIEE" for 10$ off total bill!